Intelligence feeds provide data in machine consumable format that has a tight integration with SIEM or other orchestration platforms. 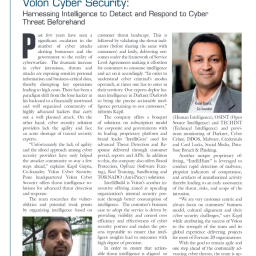 Volon’s strategic partnership with IBM would enable utilization of capabilities of one of most renowned technical dataset curated by IBM Research, customers also have option to integrate X-Force feeds in to their environment. Following are the core features of the dataset which can be integrated up via X-Force Exchange based delivery.